Archaeology 5 Edition This text pairs two of archaeology's most recognized names: Robert L. Kelly and David Hurst Thomas, who together have over 70 years of experience leading excavations. The fifth edition of ARCHAEOLOGY reflects the most recent research and changes in the field, while covering core concepts in an exceptionally student-friendly fashion using personalized examples and high-interest topics. 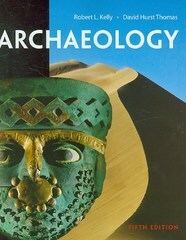 This edition continues a tradition of combining academic rigor with an engaging writing style that has made ARCHAEOLOGY one of the most well-respected and best-selling texts in the discipline. The new, streamlined edition is enhanced with full-color photos and a completely new design. A rich array of supplemental resources are available for purchase, including a book companion website, as well as a CD-ROM developed by the authors entitled, DOING FIELDWORK: ARCHAEOLOGICAL DEMONSTRATIONS.